[Update: This post was actually written by Ean, although Jane's picture would lead you to believe otherwise.] So we've been on our boat, our new home, our seaworthy vessel for nearly a week now. We've pretty much figured out where our migraine strength Excedrin should go and our warm weather clothes and our cold weather gear and even the cat scratching post. All in all, we've gone a long way into settling into our new home. Just one major thing left to do...operate our home which is, after all, a boat. We confess, we hadn't once turned on the engines because, despite my four-day diesel mechanics course, we were, truth be told, afraid of them. We hadn't done a vhf check, hadn't run the generator, hadn't even raised the sails. In short, hadn't treated the boat like a boat...until today. 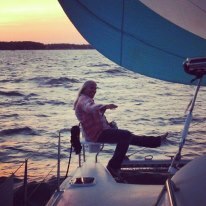 Enter our awesome broker and now also equally awesome instructor, Tommy Smith of Sail Away Catamarans. Awesome because he spent four hours with us today teaching us about the particulars of our sails and the lazy jacks/bag that they are set in, and about our rigging (our spreader lights are really tractor headlights--who new?!) and then we took "Joy" out for a spin. We can't say by what percentage we feel more confident about handling our boat because "100%", "200%","500%" falls far short of how much of a difference a few hours with Tommy as our instructor has made. Suffice it to say that the "before" and 'after" difference of a few hours with Tommy is that now we are excited about taking our boat out for more practice on the South River, whereas before it seemed only daunting. If we're starting to sound a bit like avid followers of the "Cult of Tommy", it's only because he's the one--the only one in our experience--who understands the value of building long-term relationships with his clients. So if we sing his praises from time to time, it's only because he continually blows away the bar. So, we can't say it often enough, if you're even considering a cat and you're in or can get to the Annapolis area, you're just wasting your time with anyone else. Seriously. Its Great that you found Tommy, and he rightly deserves every bit of praise you give him. People like him are hard to find. Enjoy your next adventure whether on a boat or not. Tommy is a one of the rare, truly Good Guys. Great heart.